Hello! Have you been following along with the Spellbinder's To DIE For!! Winter Release Blog Frenzy this week? 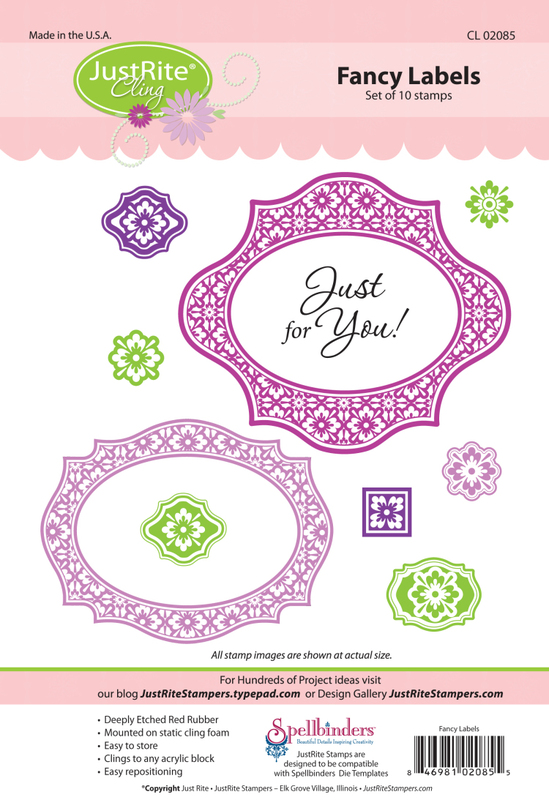 On Day 1, my JustRite teammate, Debbie Olson, previewed two new products, including the lovely S4-310 Labels Eighteen die templates. 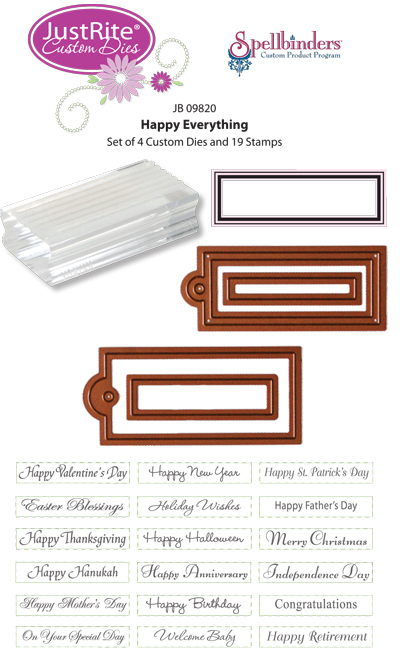 Today, JustRite Stampers is previewing a new cling set, CL-02085 Fancy Labels, which matches the existing Spellbinders S4-248 Labels Thirteen die templates and the new Labels Eighteen Die previewed by Debbie. Isn't it beautiful? This set is officially part of the February Release, but we are so excited about it that we are releasing it now.. it is in stock and ready to ship in the store! I unconventially started my project by first dying some seam binding ribbon with various colors of Tattered Angels Glimmer Mist. 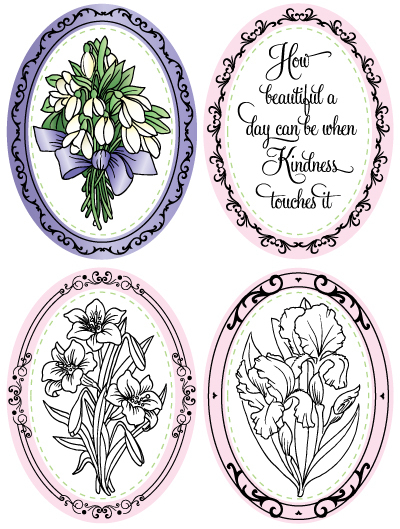 Then, I selected a few markers and colored my lilies to go with the ribbon. I happened across some K & Company patterned paper at Michael's this week that I thought would go well. When I made my card, I ended up making 2 different versions.. I couldn't decide which one I liked the best.. Above is my first version (with jeweled gold embossing powder, shiny gold pearls and a Prima rose). It somehow didn't look quite right to me, so I re-did it with black embossing powder, black pearls and a button instead of the rose.. This is version 2 (below).. I don't have the Labels Eighteen die templates yet, so please excuse my hand cut labels minus the lovely embossed edges! 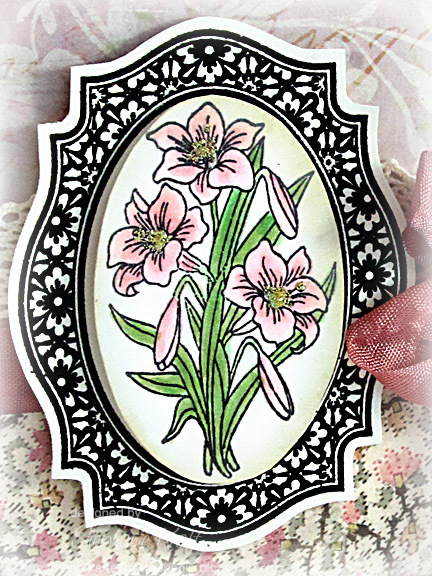 For the center of the label, I stamped and colored the lily from JB-09270 Beautiful Day Borders & Centers - Interlocking, cut out the oval and popped it in the center with foam tape. The sentiment, Happy Birthday, is from JB-09820 Happy Everything Mini Tag Kit - Interlocking. Both of these sets were released this month and are available now! Accessories: Gold Stickles (Ranger), Lace (Kaisercraft), Black pearls (Pizzazz Aplenty), Glimmer Mist (Tattered Angels), Seam binding ribbon, Twine (May Arts), Button, Embossing powder, Foam tape, Thread, Sewing machine. Gold version same supplies except I used Jeweled Gold embossing powder, Shiny gold pearls (Pizazz Aplenty), Prima rose. 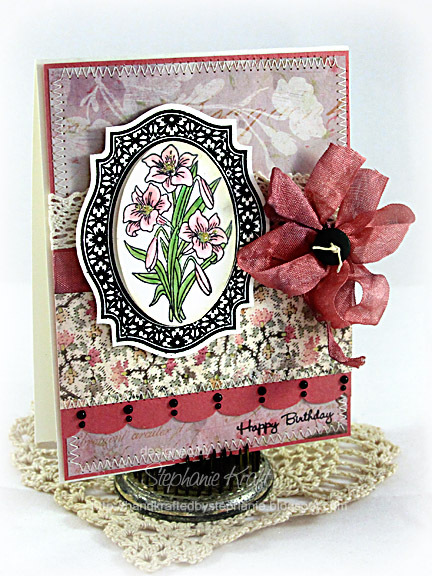 Beautiful BD card! Lovely design, fab coordinating papers! Lovely cards. We wouldn't even have noticed the hand cut label if it wasn't mentioned. 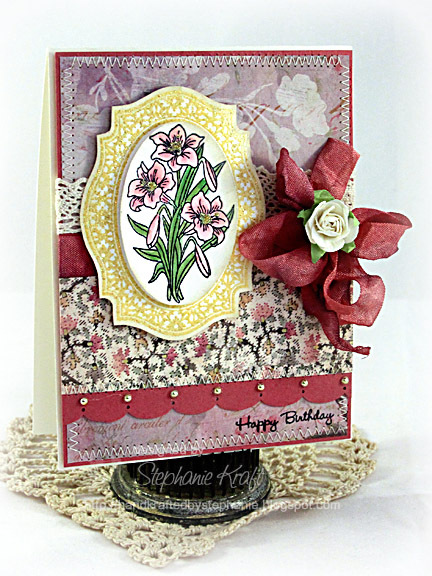 I absolutely love what you do...I would not think of using the beautiful blends of card stock and some of the fabulous embellishments you use...I've got so much still to learn (constantly!) but love the blogs as I get so many ideas...now to put them to use! TFS! Gorgeous! Love the rich colors! Beautiful frames and papers. Gorgeous card. The background papers are just wonderful! Fabulous frame and hand cut? Wow! Thanks for sharing! Wonderful and so elegant Stephanie, love it!